Lucy’s out of school business! 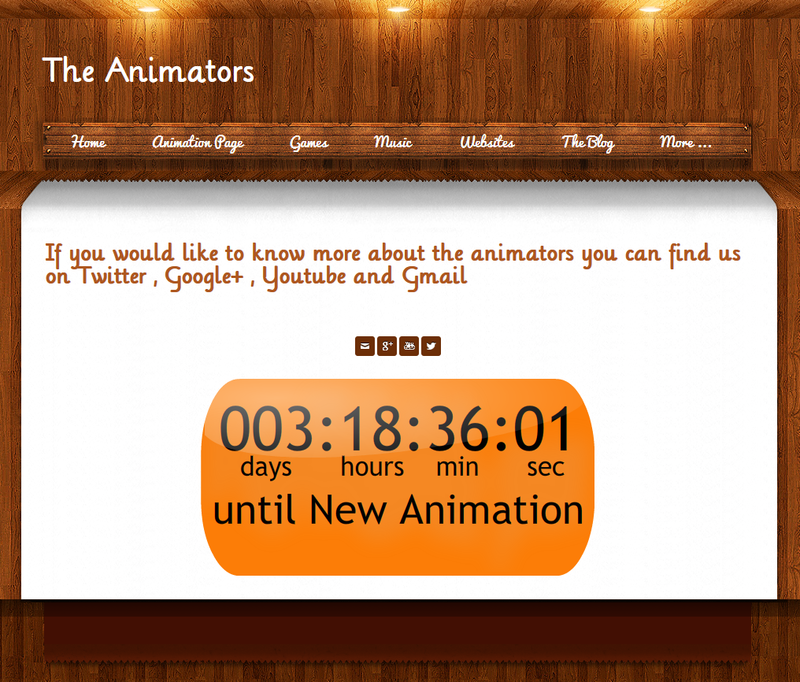 The countdown to the animators next upload! I visited a partner school a while ago and as I walked through the Foundation Stage I looked over at a group of children on the class computers. The teacher laughed as he explained to me that when the children had started school in September they went immediately to the computers, picked up the mouse and pointed it at the screen! Their pre school experiences with gaming platforms clearly dictating their understanding of how to approach this new experience. I recently recounted this story to a friend who explained that his three year old had stood in front of their television, put his hand in the air and attempted to ‘pinch’ to control its content as he was already comfortably doing with his iPad! These two incidents illustrate the stark difference in experiences with technology for our youngsters and older generations. They also highlight the need for us as educators to understand the out of school experiences of children in order to bridge the formal and informal learning gap. For many pupils their out of school experiences with technology and their inquisitive, exploratory approach to each new device only serve to widen the learning gap. Celebrating their skills and developing understanding in school provides us with an opportunity to build on their out of school interests, benefiting their learning and sense of achievement. Adam, Josh, William and Regan make their own animations and upload these onto their website http://theanimators1.weebly.com/animation-page.html Such enterprise and innovation are celebrated, supported and where possible, these out school interests encouraged within the school setting. We plan on ordering staff cakes from Lucy! Our older children now bring their own devices into school to use as learning tools where appropriate. The technology they so often hold in their hand while out of school has such potential in the classroom that it makes sense to embrace it and explore its learning potential. The challenge is for us as educators to find ways to blur the children’s formal and informal learning, to bridge the gap between in school and out of school experiences in order to support their development, and where appropriate using the tools they are becoming increasingly accustomed to. I’ve been reflecting on the simple things that can have a profound impact and wondering what we can do more of to further the children‘s learning experiences. Something that was successful last year and is worth taking further is sharing our learning. Pupil to pupil, class to class and school to school. The children really enjoyed sharing their learning with others. Not only did it help consolidate their own understanding, but it also made certain areas of learning more attractive and easier for others to grasp. 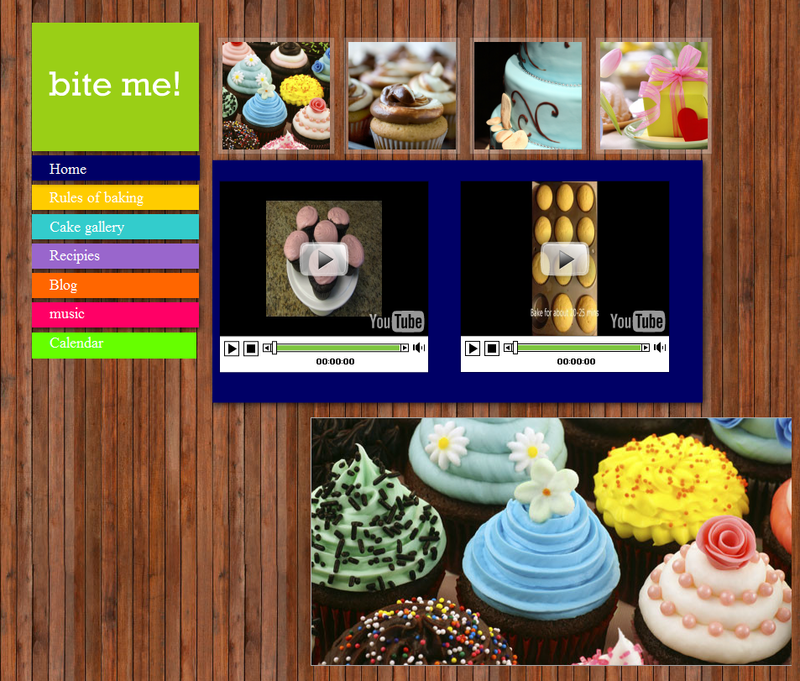 We made good use of assemblies to share the children’s recorded learning, they enjoyed using the class blogs, the ‘show me’ app for screen casting and the school’s green screen studio to produce ‘micro lessons’ on a variety of themes. Children were very keen on suggesting ‘micro lessons’ they felt might help others and much of their content was produced by themselves, in their own time – a real sign that they were enjoying the process. Below are some examples of how pupil to pupil, class to class and school to school sharing helped children further their learning. All classes make good use of learning partners, which is a simple way of encouraging the children to share their learning, discuss their ideas and provide peer support. In addition to this beneficial approach the children also made tutorials on the iPad using the ‘Show Me’ app. They reduced concepts down to two or three minutes and recored simple screencasts to help their peers with tricky areas of learning. We kick started the idea by showing some of the first few in assembly which galvanised the children to create more. They were embedded on the school blogs which enabled children (and parents) to easily access them as often as they wanted. As a three form primary I often feel this is an area we should be making more use of. Older and younger classes really enjoy pairing up, as do classes in the same year group. The older children loved dressing up on character day and reading to the younger children in costume! Groups of children going to other classes to share a project or present findings not only gives them a real sense of purpose to their learning but makes a great starting point for further learning for the class. This year we are keen to look at how class to class sharing can help further the children’s speaking and listening. Working closely with a small network of schools can provide some fantastic opportunities to develop projects beyond the classroom. I have written here previously about the Y6 Space Museum, that not only opened to other classes and parents at our school, but went on the road enabling the children to share their learning with their peers at Heathfield in Bolton. I have also written about how a group of children used the green screen to make adverts which acted as a lesson starter for children in Hall Park in Bradford. We have fully enjoyed hosting kidsmeets which is another great way of school to school sharing. This year I hope to further explore the potential for such approaches to sharing learning. It would be great to hear from others who are doing something similar. Research supports what those in education already know – parents‘ influence on learning outcomes can be greater than school influence. A few years ago I attended a workshop on social capital which confirmed the need to build strong and lasting relationships with parents and families in order to give our children the best possible start in life. Following this workshop we worked hard to develop our social capital and were ultimately recognised for our efforts with the Parental Engagement Quality Standard from the Schools Network. We make good use of technology in our work with families but have also developed some very successful ‘non tech’ approaches to ensure we reach out to all our community. Building an online presence via the school website and blogs has no doubt been of great benefit, giving families a window on children’s learning and the opportunity to engage like never before. The website has recently been changed to make it more visually appealing and less text heavy. We had originally seen the site as a place to put policies and information for parents but most of these were being read less than their paper versions! In short the website was not engaging parents and families, it may have served as a form of online prospectus for new parents but its use was limited and in need of an overhaul. We made use of film and our green screen studio to create a virtual tour of the school, the children were heavily involved in filming with uniform being modelled and described rather than simply written about. 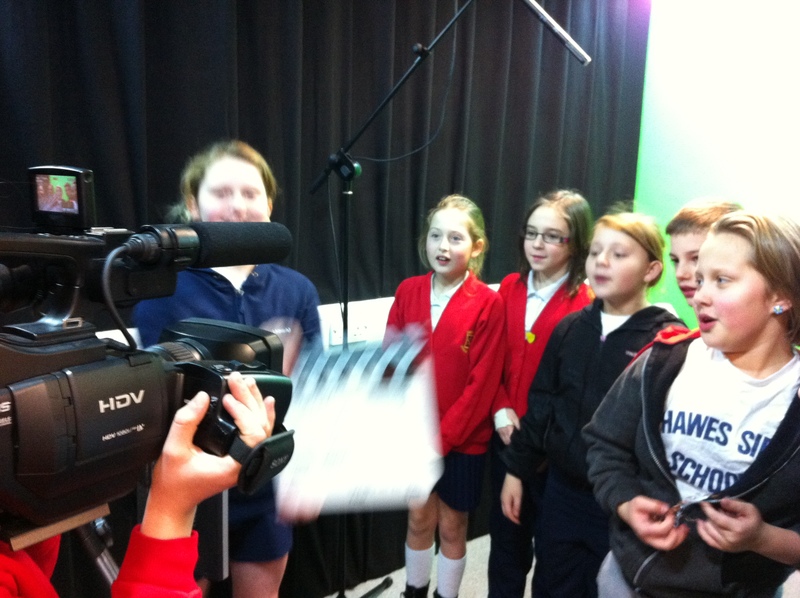 The children also described different aspects of the school, writing scripts to run on an auto-cue in the studio. Links to learning are made and again the children play a great role in promoting the use of platforms such as ‘I am Learning’ which support and complement in class activity. The blogs have undergone significant change over the last few years changing from an online social environment run by the children to a class based resource jointly managed by staff and pupils. Many pupil groups and projects also have blogs to ensure parents have a very clear idea about school residential visits, charity work, assemblies, school and Eco council and much more. Not only do they know about such group and their work, they can actively get involved, contributing and sharing ideas. The new approach to blogging has seen their development as a shared learning resource which is having a positive impact on the children’s education. For many of our children this is significant, having their parents ask about and share in their learning is incentive enough to see school as important. For many, their own school days were less than successful and it is easy to transmit their negativity to the children. Blogging has the potential to enable the children’s work to reach and audience of millions – but it is just that, potential. It doesn’t happen overnight. Most importantly for us it has proved to be a method of engaging parents in their children’s learning in a way that counters their own school experiences. In addition to making good use of technology to support engagement, we have developed a number of other initiatives that have extended our social capital. One of the most important decision we made was to fund the position of a Family Support Worker. We had discussed this idea for some time before we actually had the money to make it a reality. Julie is not a teacher – a very important factor. She relates to the parents, the hard to reach families who prior to her appointment would never have engaged with school. We had always felt we were not doing enough for those children who would arrive without breakfast, with no socks on or the soles of their shoes missing. We would feed them, find some clothing for them, but we were really just putting a plaster on the problem, not getting to the route of it. Julie is able to follow up these problems without having to rush off to class after, she makes home visits, signposts additional services, helps fill in forms etc… She has set up toddlers groups, parenting classes, basic skills workshops and much more. Most importantly, she has got the parents who need them to turn up! I have blogged previously about ERIC time and Learning Logs so I won’t say much more here, just reiterate how successful these initiatives have been and continue to be for us. ERIC (Everyone Reading in Class) time was a way of getting more parents into school. Many of them were already on the playground by 3.10pm so it was simply about opening the doors 20 minutes before the end of the school day. The Learning Logs have broken down the barriers many parents felt when faced with rules and regulations around homework, it was about giving them an opportunity to work with their children in creative and expressive ways. There are no restrictions other than the work cannot extend beyond a double A3 page. We have found the parents and children love the chance to use fold out panels, envelopes, models, games and other approaches to explore the learning objectives. In class, staff will make a big fuss of the Learning Logs, they devote time to sharing them and allow the children to talk abut them in detail recognising how important this shared learning is. We have looked closely at how the curriculum can better support parental engagement and when planning topics staff now ask, ‘how can we involve parents and families in this learning?’ Sometimes it will be inviting them in to a workshop, a series of presentations, an assembly or event at the end of a project. Other times parents will be involved in the introduction where an initial stimulus is developed. Their interest at this stage can be so important to the children sustaining theirs throughout the unit of work. Learning doesn’t just happen when teaching takes place, the more we can do to engage our parents and families the better the chances for our children. The introduction of monitors around school gave us somewhere to display our digital content. A digital display board. The children had been creating photostories and presentations at home and we were finding it difficult to share their work on any scale in school. We decided to install screens around the place and scheduled the children’s work to play at key times during the day. The children are used to the screens now and look forward to seeing their work being broadcast around school but I can still remember the look on thier faces when they were first installed. I often tell the story of a disenchanted pupil in Y3 who with the support of an enlightened teacher learned to use photostory. He persuaded his mum to come along to one of our parents’ workshops and less than a week later he was producing photostories for his maths and other films to support different areas of learning. He loved seeing his work around school and it had a profound impact on his attitude to his learning. Not only that, his friends saw the potential and got in on the act! Soon we had children bringing in their own projects for us to broadcast across the school. As with anything new, when we fitted the screens we weren’t quite sure of where we might go with them. We began to test and stretch their capabilities and eventually felt we needed something more. We were fortunate to meet CMS, a local media company who agreed to fit a green screen studio for us in school. This gave us the opportunity to put the sceens to much better use. To not only share the children’s work, but also to create their own in-house films, adverts, vodcasts and more. Some of the early projects were great fun and the children immediately saw huge possibilities With the aid of twitter, an early advert made as part of a Y6 literacy lesson was used by a school in Bradford as a stimulus for a Y3 writing lesson! The children quickly turned the green screen into a roller coaster, a newsroom, the beach, a playground, outer space, you name it!! Current projects include ‘Hawes Siders’ our school soap, ‘A story from School’ our answer to Cbeebies’ Bedtime story and the teaching and learning group are making a film about how children feel about marking – this is for staff and will be used at our next professional development meeting after Christmas. The children find the green screen easy to use and it supports their basic skills development giving them plenty of opportunity for speaking and listening, reading and writing (planning, scripting and autocue feature as much in any project as filming and presenting.) The green screen studio has enabled us to explore further possiblities in the use of technology to support learning, the screens enable us to share this learning. We also use a scrolling RSS feed on the screens to advertise class blogs and relevant information. Custom widgets also allow us to screen house point totals, birthdays, awards, sports news and much more. 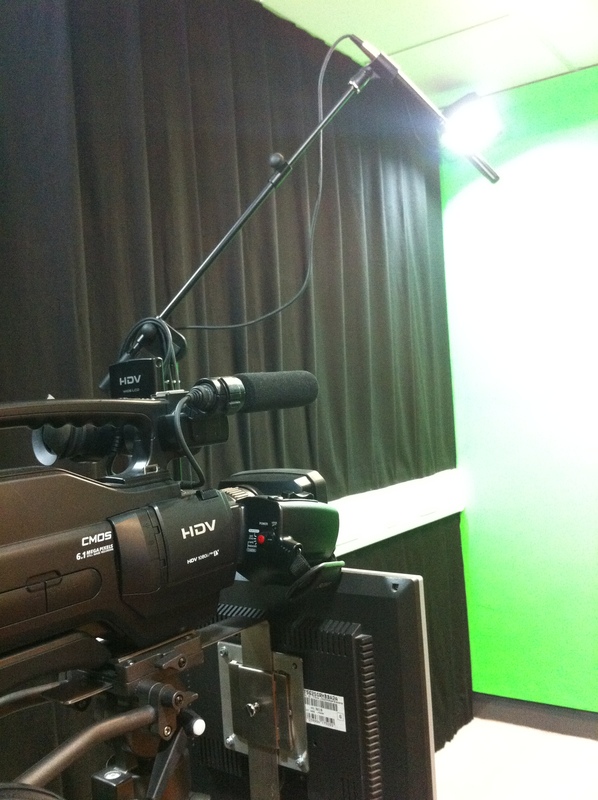 Live broadcasting is our next step, beaming in-house offerings across the classrooms and screens around school. The learning will be televised! Can I come back to you later? The first thing that impresses you about working with Tim Rylands is he doesn’t just talk about it, he does it. Before we agreed to our two days with him as part of our Kaizen staff training and development, Tim urged me to put him in front of children, so that staff could see his ideas and approaches in action. It meant a lot. It gave him credibility with staff because he got up and delivered. To sixty children at a time! Y2, Y4 and Y6. Three demo lessons that had the children reaching for language and stretching their imagination like never before. Staff were invited to get involved and enjoyed the opportunity to watch the children but also to immerse themselves in the virtual worlds being created. It was great to see some of our more reticent children rising to Tim’s challenges, growing in stature and having a ball. Staff observed Tim using a range of strategies to draw the maximum out of pupils, to plant a seed, to nudge, provoke and promote thinking. One of the devices Tim used with the children was to speak to them, listen to them for a while and then ask if he could come back to them later – which he always did. This enabled the children to think about what they were going to say next – a sort of drip feed that encouraged, prompted and helped them push their ideas along. Facial expression, tone of voice and use of props all played a part in the demo lessons. Staff took a lot away from the sessions and reported that it helped the next day make all the more sense. Tim’s reputation comes from his fantastic work with Myst but it would be doing him a disservice to suggest it rests solely on this. His work with the staff in our network took us beyond technology and gaming. He paused scenes in a number of games and encouraged staff to think about what they could see, sense, feel, smell. He asked them to picture scenes, take on the role of characters and imagine journeys, lives and outcomes. Just as he had with the children the day before. The same approaches could be taken with pictures and artifacts, through role play and much more. At its core Tim’s work is about the art and craft of teaching, a creative, questioning approach used to great effect to draw the very best out of the children, to make learning an exciting adventure. Last year we introduced our respect agenda. I have to admit I was slightly sceptical about another reward scheme and how this might be sustainable but I am happy to say my initial concerns have been allayed. Respect tokens were introduced to the whole school last September as we returned from the summer holidays. At our first assembly we explained to the children that every adult in school would be carrying with them a number of respect tokens. These tokens would be given out to any children who showed respect. This, of course led to a great deal of work in classes about what respect is, what it looks like and how we show it. We made it a focus of PSHE in that first term and we used later assemblies to share class respect charters, leaflets and posters stating their intent and understanding of the respect agenda. My worry that such promotion would lead to children fighting to hold doors open and ask you how your day was going was only borne out for the first couple of days! After that things quickly settled down, but it was great to see so many children making a real effort to be respectful, polite and considerate. The tokens are collected up in each class and each half term the winners get a treat, an afternoon at the park has been the most popular reward so far, but it can be anything the children want and we can accommodate. The children have a heightened sense of what respect means and for many the reward is now in the act itself. As with other initiatives it’s great to win and be cheered in assembly but the respect agenda further permeates school life. When we have visitors in school, we explain the system and give them a handful of tokens to put in their pockets. They quickly make use of them and the children enjoy the opportunity to impress guests! Such an approach keeps the profile high and helps ensure everyone understands how importantly the initiative is viewed. Assemblies and class time are regularly devoted to promoting respect and children understand how being respectful helps them individually, in their relationships and across the school as an organisation. This September we will have another big push as we start the academic year . The agenda has seeped into the school fibre and it is great to hear people comment on the tangible impact this raised awareness of the importance of respect has had. Tonight we held our ‘Meet the Teacher’ forums. This is an opportunity for parents to pop into school to meet their children‘s new class teachers before the summer break. The evening has grown to be a very popular event on the calendar and something we are delighted to see being so well attended. The idea for Meet the Teacher came about several years ago but it wasn’t until the last few years that we really looked carefully at how the sessions might best benefit parents. The meetings used to take place early in September but this was too late to allay many parents’ fears. By then we’d had the first manic morning back and dealt with parental uncertainties as to which class, which door, who is Mrs/Miss/Mr so and so and what does she/he look like? Through our Home School Group, parents suggested that ‘Meet the Teacher would be more helpful at the end of the summer term rather than the beginning of the autumn term and we subsequently moved the meetings. A common format was agreed with staff that had enough space and flexibility for teachers to decide how they would best like to share information with parents. For some, the sessions began as informal one to one chats while other parents looked around the class but this year most teachers gave a short presentation before speaking to parents individually. When we first set up these meetings we would be lucky to have more than two or three parents in each class, but over the years the numbers have steadily grown and it was pleasing tonight to see that most classes has upwards of half the parents there. I spoke to several families and asked if they had found the opportunity to come in and meet their children’s new class teacher useful, their response was overwhelmingly positive. They appreciated the chance to meet staff new to them, to found out about the systems and procedures for September, the curriculum, class blogs, the opportunities for them to come into school, to help the children with their learning logs and much more. Most importantly, those parents who came into school this evening now know their children’s new teacher, they have begun a relationship with them that will last for the next academic year and beyond. Meet the Teacher helps us to build a strong positive partnership with parents and families from the outset, a hugely important aspect of school life. Today we held the first kidsmeet at Hawes Side, Blackpool. The format was similar to a teachmeet with one or two differences. The schools in the most part, signed up via the wiki, presentations were limited to seven minutes (although timings weren’t too precious) and presenters were randomly selected over the course of the afternoon. What made this event different was the fantastic efforts not of teacher, but the children involved. Pupils ranging from Y1 to Y6 stood in front of a packed hall presenting their exciting and innovative approaches to learning with, and without, technology. As adults we stood in awe of our young learners. Many presenting for the first time but so confident in their delivery, so sure about the tools and techniques they shared. It was a great sight to behold, those in attendance (children and adults) left with a whole host of new ideas to try out back at school, but confident in the knowledge that others are doing the same for what they shared was tried and tested, in the classes and homes of these primary pupils. What today did was open up huge potential for this kind of sharing, both face to face and virtually and today I’m sure, will be the first of many such events. When discussing the day we toyed with a number of different formats and styles but we were keen to keep it as close to a teachmeet as possible and this worked really well. The children showed respect for each other’s presentations and great support for their peers going through the same emotions before, during and after their talks. The time sitting and listening was not a problem for even the youngest there as they were all fully engrossed in the experience. 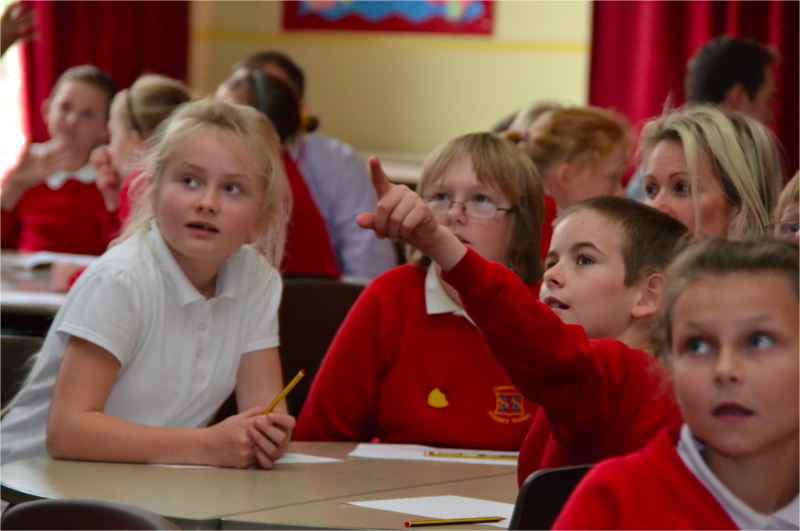 A primary pad was set up by @primarypete_ to enable children to converse in real time as we tweeters do at such events. Indeed there were plenty of tweets flying around the room as well and it was great to see the presenters receiving such encouragement and support from the wider world. The whole of kidsmeet was filmed and broadcast live via http://www.kidsmeet.org.uk as set up by @mister_jim and children back in classes were able to sit and watch their friends. 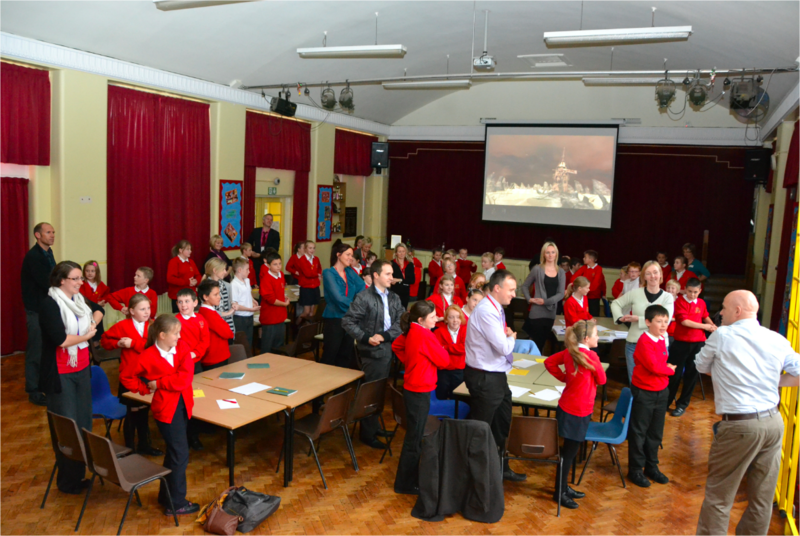 If they had any doubt, the children knew the event was more than just those in the room when @oliverquinlan presented via skype from Robin Hood Primary in Birmingham and @ianaddison’s pupils shared their work from Hampshire. Tom Sale (@tomsale) kept the event moving along and played additional presentations during the break including one all the way from Princeton New Jersey USA! The break also gave the children time for the children to try out games consoles, enjoy the buffet and mix with their peers from other schools. Many made long journeys to be here in person and it was fantastic to see @chrismayoh and his pupils from Bradford and @raff31 and his children from Liverpool. Schools from Preston, Blackpool and Fleetwood made shorter journeys and none came as far as two visiting principals from New South Wales in Australia who had a fantastic time at the event and were blown away by what they saw. Ross and Jenny stood up at the end to say a few words and are now keen to take the idea back to their schools on the other side of the world. The event was compared by Bill Lord (@joga5) with humour, consideration, excitement and understanding. Bill made the children feel comfortable and confident when presenting and kept the afternoon ticking along. When there are pauses between presenters it is great to have someone who can expand on the themes and provoke discussion. Bill did just that and also gave a short keynote which was both fascinating and fun hitting the right spot with everyone in the room – not an easy task! Kidsmeet was a huge success and one that we all want to build on in the future. The children have a taste for presenting, I don’t think they’d let us drop it now anyway! For a full list of all those in attendance check out the kidsmeet wiki. I’d like to thank them all for making the day so special. The fantastic efforts of everyone involved will no doubt ensure the event lives long in the memory of all those who came. In my last post I talked about the need for a curriculum that helps prepare children for the future. There are some key qualities I believe should be at the heart of a new curriculum rather than left to chance outside of it. These qualities are not easy to measure in any tangible form and this may go some way to explaining their absence from many classrooms. In his book ‘Building Learning Power‘ Guy Claxton explores some different reform models from around the world that are helping children develop their ‘learning power’. The Golden Key Schools in Russia operate along the lines of extended families. They follow Vygotsky‘s philosophy and an understanding of the process of interaction is implemented within the Zone of Proximal Development by placing children from 3 – 10 years in family units of 15 – 25 rather than traditional, age grouped, classes. Staff attend training to develop a ‘community of learning’ and parents are also active in school events with the emphasis placed on learning as a community. Amongst the other examples Claxton looks at as models for developing collaboration and communication are Ann Brown‘s Communities of Inquiry in Cambridge, Massachusetts and the PEEL project in Victoria, Australia. Bellaire Primary School in Victoria allows older pupils to take a more active role in planning their learning by running skills workshops which the children attend before taking part in application classes where they put the skills they have learned to practical use. The children very quickly learn to plan their own timetable and learning, making it relevant to their own interests. This brave approach develops independence and lifelong learning skills that can only help the children as they move into secondary education and beyond. The Skills Based Curriculum developed by Chris Quiqley not only gives pupils more ownership over their own learning but helps with planning for progression. It would be great to see the work of these and other educators such as Sir Ken Robinson and Mick Waters, being considered by government as they look at the Primary Curriculum.